Moses Warren Clement (1834-1885) was a son of master carpenter Moses Clement. Prior to his enlistment in 1861 at the age 27, he probably worked with his father and his father’s partner George L. Abbott on the construction of many houses and public buildings in Andover including Abbot Academy’s Smith Hall in 1854 and the Andover Town Hall in 1858. He drilled with the Andover Company in the spring of 1861 and mustered in July as Company H’s 2nd Lieutenant. 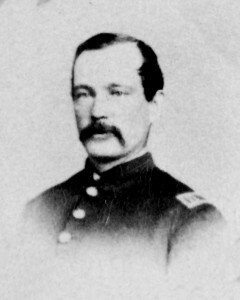 While Clement, with the rest of the 1st Massachusetts Heavy Artillery, garrisoned the forts protecting the city of Washington, his twenty-year-old brother Charles A. Clement saw significant action with the Massachusetts 13th Regiment of Infantry and was mortally wounded at the Battle of Gettysburg.